So we know the prison and The Governor are in for season 3. But what else will be in or out? I’ve had conversations with a few people I know and there are mixed feelings/opinions regarding what we all think will be in or out. Dexter – I am really excited to see Rick dispatch Dexter amidst the confusion at the prison when Block A spews out its zombie inhabitants. Thomas Richards – For the shock factor, I think this may be out. Considering the lack of characters to play with and Hershel only has two daughters left, one being Maggie who can’t be killed as per the comic. Beth, who isn’t in the comics, is significantly older than the twins killed by Thomas so it looks like he may just be a small role that soon becomes zombie-fodder during the Block A carnage. Carol’s suicide – Based on Carol’s character in the show, I don’t think this is in unless the scenes from the prison are enough to push her over the edge as she seems to have grown stronger since Sophia’s fate became known. Plus there’s a spark between her and Daryl (who’s character doesn’t exist in the comic…yet) which may mean she has more to live for *wink wink nudge nudge*. 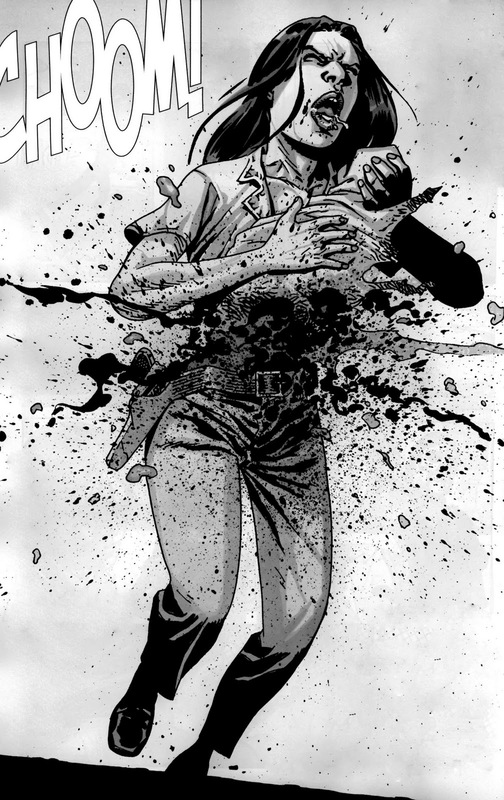 Lori and the baby’s death – I’m unsure what the show will do in regards to this – the deviation from the comics in seasons 1 and 2 leave me 50/50 whether this will be in or not. Part of me thinks that it’ll be cut out due to the controversy this would cause with viewers that are not readers of the comics and therefore could impact ratings etc. The other part of me believes that such an integral part of the story and the shaping of Rick’s character subsequent to the event can’t be omitted. A lot of the psychological content from the comics will be stripped regardless – the lack of Tyreese as a character who went off the deep end in the comics, the twins being taken out by Thomas plus Rick’s trip back to the original camp outside Atlanta to finish Shane off when he realised that they’re all infected and that the bites aren’t the cause – death is. One thing that has been confirmed is that Merle will be returning. This may mean that Rick won’t undergo the loss of a hand at the whim of The Governor seeing as there is already one handicapped group member. Or, The Governor may finish the job and take Merle’s other hand? My initial thoughts from when we saw the group that Rick, Hershel and Glenn encountered in season 2 is that they may be a scavenger party from Woodbury and just a taste of what’s to come. It also turns out that The Governor isn’t actually Philip Blake but his brother Brian (read Rise of The Governor novel for the back-story). In this regard, I can understand the casting of David Morrissey based on Brian having been a pathetic loser in the eyes of his younger brother. So even though there may be a lot of potential disappointment with the amount of content not carried over from the comics, the entertainment value (if the previous episodes are anything to go by) will be through the roof as the series progresses in leaps and bounds. What’s your thoughts/hopes/fears for season 3? This entry was posted in The Walking Dead and tagged AMC, Atlanta, Comics, David Morrissey, Dexter, Rick, Robert Kirkman, Shane, The Governor, Walking Dead, Zombies. Bookmark the permalink.